SEEKING: Trial anywhere around Europe. I'm from Australia of Samoan Heritage. I'm a former Rugby League player who played for Gold Coast Titans and also QLD Cup (Premier)in Australia. I made the transition last year to rugby playing second five or inside centre. I have played against and with professional rugby/league players, and been part of professional organisations. (Gold Coast Titans). I bring the X factor to the game and learnt the game fast. Says my coach. 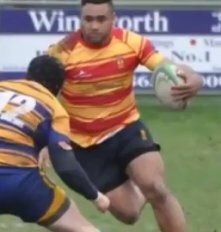 But I'm ready to step it up now that I have learnt the fundamentals and worked hard during the off season and season becoming top try scorer 26tries. I guess this is a long shot but I was looking for a trial anywhere around Europe.